I have decided to make the Croatian Shirt from the Folkwear pattern, #117. 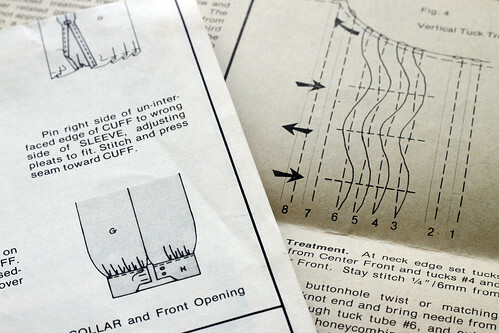 I bought the pattern in 1978 and have made it at least three times. I just love it. It has a shaped arms-eye in the front and a straight back piece. The special cuff, collar, and tuck details make this a fun shirt to sew and wear. The pattern was taken from an actual folk shirt obtained in Romania. So the style could have been worn in Transylvania, right? The documentation that comes with the pattern states that after much research it was decided the tucking on the shirt makes it a Croatian folk shirt rather than a Romanian one. This entry was posted on Sunday, October 4th, 2009 at 3:00 am and is filed under Sewing. Tagged: Sewing. You can feed this entry. You can leave a response, or trackback from your own site. This looks as if it must be very pretty. Far too complicated for me to make – but I am full of admiration. Looks yummy and like lots of fun.